The playground is a place for play and learning for all children, including children with disabilities. When the playground presents physical barriers such as inaccessible surfaces and routes, play, learning, development and the self-actualized benefits of the leisure experience can be stunted or even eliminated for a child with a disability. There are more than 100 different commercial varieties of playgrounds surfaces on the market. Lack of reliable product performance data on the effectiveness of safe, accessible playground surfaces relative to cost for installation and ongoing maintenance prohibits public playground owners from making informed choices on the selection of surfaces most appropriate for their public setting. 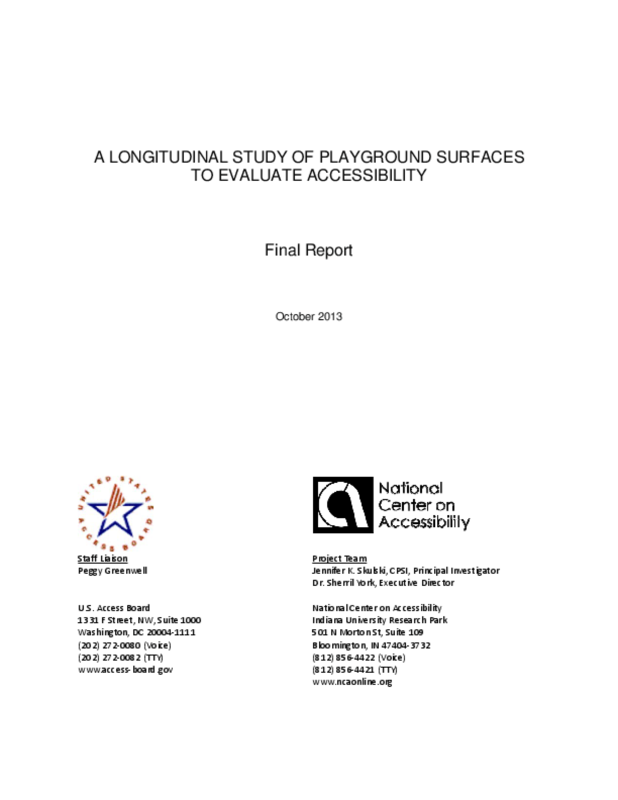 The purpose of this study was to evaluate a variety of playground surfaces, their ability to meet accessibility requirements upon initial installation and maintenance over a five-year period. The research questions include: how well do various playground surfaces meeting the accessibility requirements upon installation? What are the costs for the various playground surfaces? What accessibility issues arise out of initial installation? What maintenance issues arise? Results from this study indicate there is no perfect playground surface. Even within 12 months of installation, each type of surface has had some sort of issue or series of issues that may affect the product's performance and contribute to the necessity and frequency of surface maintenance to assure accessibility and safety for use by children on a daily basis. Copyright 2013 National Center on Accessibility, United States Access Board.